I am enjoying amateur radio for the second time in my life. During high school I was licensed as a novice with the call sign of WN3OPF. I had built a one tube oscillator using a 50C5 for a XMTR , a RME 4350 receiver, and a 40 meter dipole. I had wanted to upgrade at that time to a general class license but the 13 wpm code requirement eluded me up to the time I started attending college. I left my ticket expire as I didn't have time for both a hobby and school work. Recently my interest was revived and I built an SW40+ transceiver. I took both the technician and general class license tests on the same day and was granted my general class ticket in Feb. 2008. Although licensed as a general, I didn't feel "entitled" to the license until I got my code speed above the former requirement of 13 wpm. I constantly strive to improve my CW proficiency and become a better code operator. My main rig is a Heathkit HW-101 into a homebrew 5 band Windom matched with a homebrew air core 4:1 balun and an LDG autotuner. 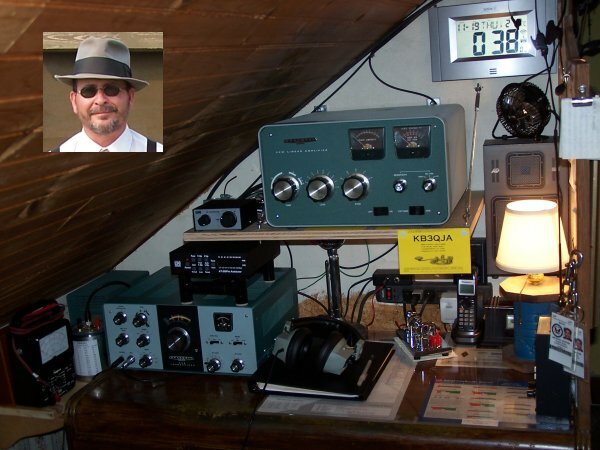 The Heathkit SB-220 is a recent addition that I am able to use on 20 meters without a tuner. I use a D-104 Astatic mic for SSB but the vibroplex "bug" gets most of the use as almost all my contacts are on CW. I also enjoy participating in a weekly 2 meter local net and am a member of the Cumberland Valley Amateur Radio Club. I am a member of the ARRL. I am pleased to be a new member of the North American QRP CW Club. I hope to be making a lot more use of the QRP rig. I love to rag chew.